Colostrinin Benefits And Side Effects | Does Colostrinin Work? Colostrinin is a nutraceutical complex that promotes healthy brain aging. It is high in Proline-rich Polypeptides which have many positive effects on the body. Colostrinin is derived from bovine colostrum, which is a special nutrient in the form of milk produced by cows and other mammals for their newborns during the late stages of pregnancy. 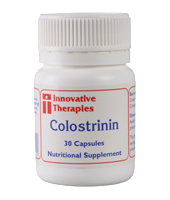 Colostrinin is a nutraceutical complex derived from the Colostrum of cows. It has been used in the past to provide protection from disease. In fact, the polio vaccine was developed using antibodies from Colostrum. The nutrients in Colostrinin have been known to improve the immune system's ability to fight infection, but also quiet disorders of an overactive immune system such as asthma or allergies. Recent studies have concluded that the Proline-rich Polypeptides in Colostrinin have a positive effect on memory and overall brain health. The colostrum in Colostrinin contains protein, antibodies and carbohydrates and is low in fat. It provides protection from diseases to infants before they have a chance to fully develop their immune system. This led people to use Colostrum to fight infections before antibiotics were discovered. As more and more diseases become immune to common antibiotics, scientists are investigating products such as Colostrinin to try to replicate its disease fighting effects. Preliminary studies have indicated that Colostrinin may aid patients with dementia by providing IGF-1, a compound lacking in patients with memory problems. Scientists are working on finding treatments for Alzheimer's disease using Colostrinin. Research has shown that Colostrinin has many benefits. It helps protect brain cells, and helps promote healthy brain aging. Tests have shown that it has a positive effect on mild to medium dementia compared to a placebo. It provides protection from diseases by supplying antibodies. It has been known to aid the body in fighting viral, bacterial and fungal infections. It may reduce the effects of aging on the body by suppressing the changes that occur to DNA over time. It is a source of anti-oxidants which are also known to reduce aging. Colostrinin does not usually have side effects when taken as directed. On the rare occasions when side effects occur, they are usually mild and subside spontaneously within a few days. These side effects may include anxiety, logorrhea and insomnia. How does Colostrinin Help Brain Function? The proline-rich polypeptides in Colostrinin's bovine colostrum is believed to help enhance long-term memory retention and overall brain function. As such, Colostrinin can be a beneficial supplement for improving memory and brain health in general. Wondering about which brain supplements ranked better than Colostrinin? Take a look at our brain supplement reviews!